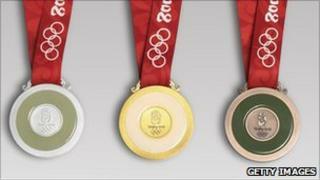 The Royal Mint has won the contract to produce athletes' medals for the London 2012 Olympics. The clutch of gold, silver and bronze medals will be produced at the Mint's headquarters in Llantrisant, Rhondda Cynon Taf. Around 4,700 medals are planned, although the final design will not be announced until next summer. Royal Mint's chief operating officer Adam Lawrence described it as "great news" for Wales. He said the contract was a welcome development for the company's 800 employees and its suppliers. London 2012 chief executive Paul Deighton said: "We're delighted to be working with the Royal Mint, a company established in the UK for 1,100 years, to produce the London 2012 victory medals. "The Olympic and Paralympic medals are presented to elite athletes at the biggest sporting event in the world on an individual's pinnacle career moment and we're pleased to announce that they will be produced in south Wales." A shortlist of the UK-based artists who will design the medals is currently being drawn up. Modern gold Olympic medals are plated with about six grams of gold, while the runners up medals are struck from pure silver. Designs of the medals vary for each Games. Beijing was the first to incorporate jade into the medals which appeared as a "bi" or ring on the reverse.